Uponor Ecoflex A complete range of pre-­ insulated pipes system for heating, cooling and water distribution. Combines excellent heat loss performance with high flexibility and easy installation. Uponor Decibel The modern silent soil and waste pipe system, combining innovative technology with sound insulation. The noise level is below 10 dB at a flow of 2 litres/second (acc. EN 14366). 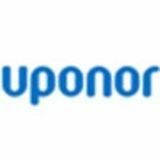 Uponor Thermatop Radiant heating and cooling modules for integration in seamless gypsum ceilings . It provides energy efficient thermal comfort and excellent room acoustics. Uponor TABS Utilising the concrete’s thermal mass in the building’s structure for heating and cooling. The concrete surface activation can be extended with a thermal socket that enables cooling and heating elements to be suspended directly from the concrete ceiling to cover peak loads. Uponor riser installations The Uponor multi-layer composite pipe system combines easy installation with certified safety features. Uponor Smatrix PRO Central controller for multiple temperature zones and up to 192 rooms in commercial buildings. The solution includes an interface to BMS via KNX gateway. S-Press PLUS – the press fitting for Uponor composite pipe With a reduction of pressure losses by up to 60%, as result of the Zeta value optimised fitting design, S-Press PLUS ensures an optimal flow rate. Uponor snow and ice melt Reliable systems for outdoor areas like driveways, emergency access roads, parking spaces and pedestrian areas. A less time consuming and expensive snow removal and salting process. Uponor Smatrix Aqua PLUS- coming soon For the permanent smart monitoring and regulation of the entire drinking water installation as well as automatic flushing for compliance with hygienic requirements and standards. Our employees enjoy a more comfortable work environment, while we achieved cost reductions.